Altius volantis A creed rainbow dash has known sense foal hood. But she never knew how important that phrase would be to her. After the day of darkness Rainbow moved to Cloudsdale joining with the rest of the wonderbolts. Cloudsale was no longer mobile and pegasi could barley weather craft anymore it took everything to maintain the city. The wounderbolts became the backbone of the cloudsdale military under Captain spitfire. Rainbow fought many hard battles with her shield brothers and sisters, even taking to the new forms of magic specifically that of a storm caster. In a desperate battle Spitefire gave her life to save the troops. Normally soarin would have taken over but he had no desire for the position which shifted to his candidate Rainbow dash. Even with such a sacrifice by spitefire, Rainbow and her troops faced a perilous battle, with no reinforcments from cloudsdale. A stroke of luck came in the form of a friend rainbow had made who her empire despised. Vampires turned the tide of the battle saving rainbow and her army. Rainbow had become accostumed to working alongside such individuals even giving them a pass through cloudsdale lands to bolster one of there own strongholds. Despite her promise, Elector lord Angelico ambushed the vampires slaughtering them. Caught betrween her own lord and the allies who had saved her Rainbow made a rash descion. She approached the storm throne and challenged Angelico for his position. A fearsom battle was fought between the two. Rainbow lost most her left wing in the conflict and a dagger across the throat nearly ended her life. But the lord would realize his folly all to late as he was gloating and rainbow dash took the knife used to cut her own throat and buried the blade into his throat severing his spine as it pierced. 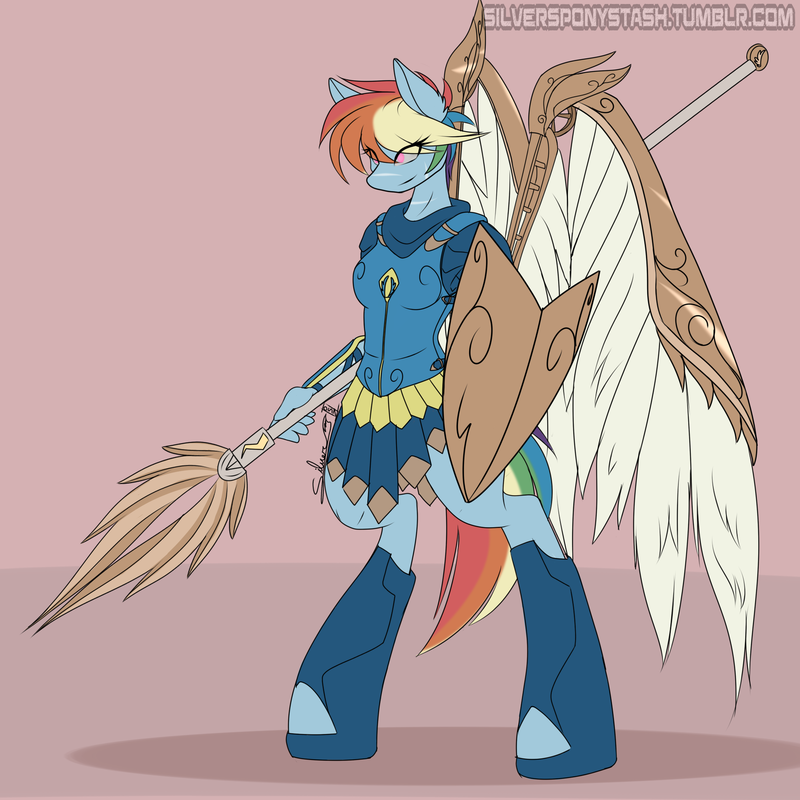 Rainbow dash had through trial of combat become the new elector lord of cloudsdale even if barly alive. The amputation of both her wings lead to the innovation of the ‘Ani’ Wing system that she had grafted to her back, using brass and glass plated feathers to catch ambient amounts of the magic she used she gained flight yet again. Altius volantis Soaring Higher, How much higher could she soar before the wax melted only time could tell.